Before cleaning leather, you must first determine what type of leather you have: At Clean Bee we can clean your Aniline, Pigmented, or Nubuck leather furniture. Caution! 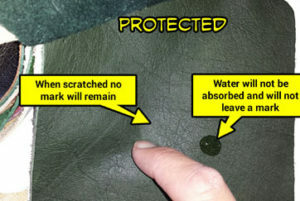 When cleaning any type of leather, please test on an inconspicuous area first to prevent permanent damage. 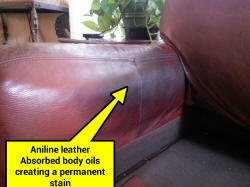 Aniline leather may also be called: “Unprotected”, “Naked”, “Natural” or “Pure”. Some manufacturers may call leather products by company names to separate themselves from other company’s terms. 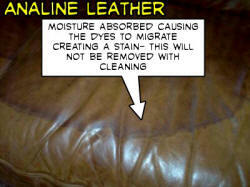 Aniline leather is defined as a hide that has been·treated with aniline dye. Aniline dye can be both organic and inorganic material used to impart color to the hide. Aniline dying is carried on in the wet end of the processing stage. The dye is transparent and allows the grain and natural characteristic to show through. 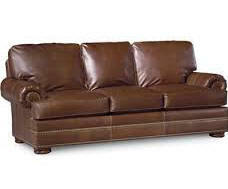 This leather has a soft “hand” or feel and has been described as buttery soft. This leather is very susceptible to sun fading, spills soaking in creating areas that look like stains but are not removable. It is also susceptible to body and head ‘oil penetration. Oil penetration has soaked in like body lotion and is not removable without creating blotchy areas. This should be kept in mind when choosing where to use it. Bad specification for use will equate to a poor performance and dissatisfaction both with the leather and the specifiers. Nubuck leather may also be called: “Reverse Suede”, “Suede”, “Distressed” or “Bomber”. Some manufacturers may call leather products by company names to separate themselves from otbercompany’s terms. Nubuck is aniline leather that the grain surface bas been sanded or buffed to create a velvet-like texture or nap. Many times nubuck is confused with suede. Suede is actually the flesh side of the hide or both sides of a split. Nubuck is defined as a hide that has been treated with aniline dye. Aniline dye can be both organic and inorganic material used to impart color to the hide. Aniline dying is applied on in the wet-end of the processing stage. The dye is transparent and allows the grain and natural characteristic to show through. This leather has the softest “hand” feel due to its velvet like texture. Nubuck is the most sensitive of leathers. 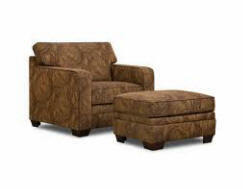 Nubuck is very susceptible to sun fading, spills soaking in creating areas that look like stains but are not removable. It is also susceptible to body and head oil penetration. Oil penetration has soaked in like body lotion and is not removable without creating blotchy areas. This should be kept in mind when choosing where to use it. Bad specification for use will equate to a poor performance and dissatisfaction both with the leather and the specifiers. Pigmented leather may also be called: “Painted”, “Protected”, “Finished” or “Semi-Aniline”. Some manufacturers may call leather products by company names to separate themselves from other company’s terms. Pigmented is aniline leather that has had a finish and topcoat containing pigment applied to the top-grain side of the hide. The finish and topcoat are applied to add a protective coating that assist in water repellency and cleanibility. It is also used to enhance the esthetics of the leathers’ appearance. This leather has a smooth or slick “hand” feel due to its finish system. This leather is very easy to clean. Many times it is called kid and pet friendly; however kids like to write on things and this will not come off any type of leather. If that occurs the finish system normally has to be removed in that area and be replaced by a specialist in leather repair. Dogs and cats can cause damage with nails and body oils. The most common issue we see is the finish system not adhering. This can be caused by numerous reasons including bad surface prep, not enough resins in the finish, inter-coat adhesion issues and more. It should suffice to say that when a finish system fails it normally is a manufacturing issue. There exceptions such as abuse or body oils degrading the finish. This should be kept in mind when choosing where to use it. Bad specification for use will equate to a poor performance and dissatisfaction both with the leather and the specifiers.